It isn't often that I build a quilt around an English Paper Pieced project, actually I never have! For some reason I was stoked about this center piece and couldn't wait to expand on it. As I was staring at the Striped Octagon center (pattern available from Tierney Barden: 'Striped Octagon'), I had numerous ideas before I settled on the final design. Which is what I love about quilting! Nothing is set in stone...things can morph several times before settling on anything. I tried to carry the octagon colors through the white. Some stripes went to the edge, some were abruptly stopped. Really, I just wanted to have lots of colors and stripes, yet leave some wide open spaces...otherwise know as 'negative space'! There were a few pitfalls trying to match the stripes with the center. I didn't expect having to work so hard for it, but I did and it was worth it. Letting the top stew for a week or two, finally an idea came to me on how I wanted to quilt it. I started with the center panel by making circles in each white square and in the center of each octagon stripe. Making pebbles is fun, trying to make one perfect circle is not fun, nor is it easy! I did my best! Each stripe is quilted in a matching thread using 1/4" straight lines, with some extend through the background. The rest of the quilting combines straight lines and circles. 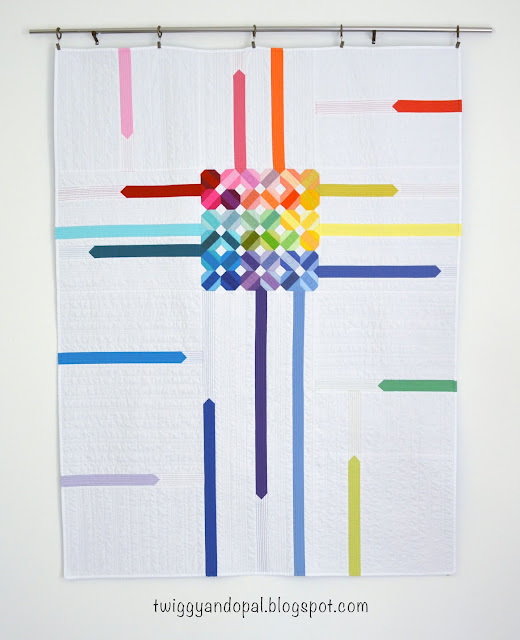 Which...led me to the name of this quilt...'Tinker Toys'. These are Tinker Toys! Wooden spool like circles and lots of colorful sticks that can be made into all kinds of amazing things! An imagination toy! 'Tinker Toys' is a seemingly complex design, but has a childlike playfulness that I couldn't resist exploring! I'm very pleased with this 'out of the box' finish! Playful, whimsical, rainbow all wrapped together in one little package! The binding was interesting to say the least! I decided well before I started quilting on it that I was going to take the time to add a matched binding. All the stripes that went to the edges on the top were extended through the binding. Time consuming and totally worth it! I used Kona White on the front and Kona Breakers for the back. Whew! 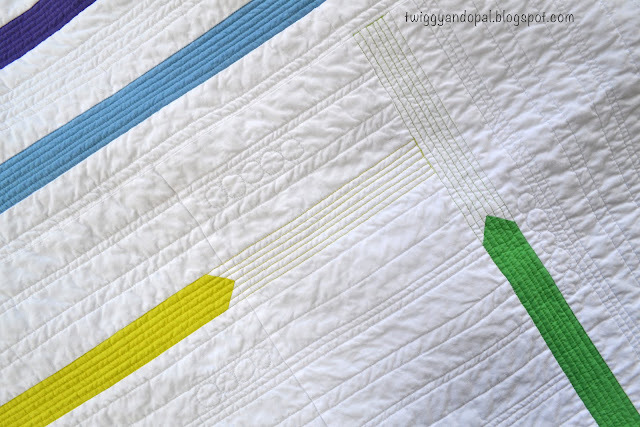 Tinkering is not a description you would use to describe quilting. Maybe tinkering on an old car! It does seem fitting for this quilt! Such amazing work and a gorgeous outcome! Your creativity and skill always impress me. Perfect name. I could see the connection immediately! Sometime would you please describe your process for taking the design into the border? It’s crazy how our childhood can come to life in a quilt! I would be happy to share my method/process for the matched binding. It takes more time and more patience, but can be worth every second of it! 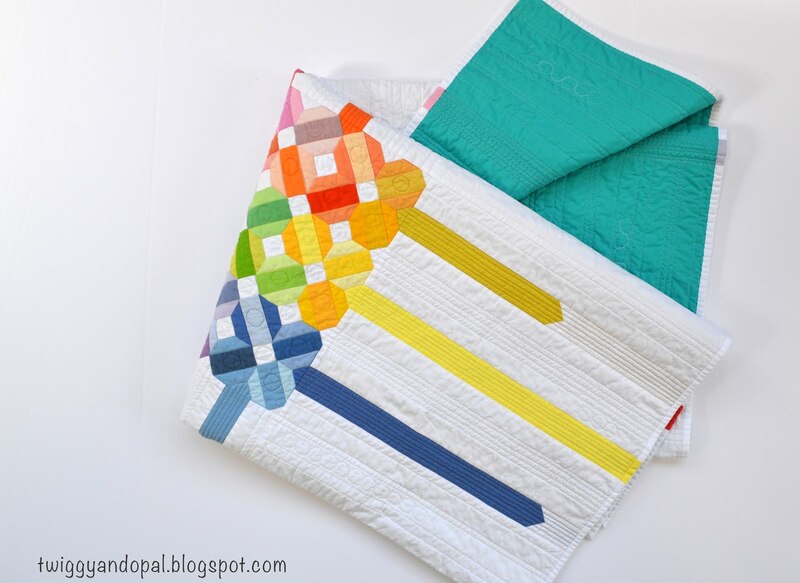 Great idea to expand what you liked about the design into a bigger quilt. Really cool! This is beautiful. The quilting is so perfect and shines through to the back. 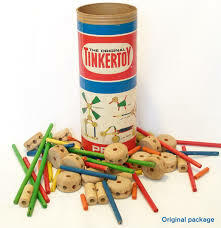 Loved Tinker Toys as a kid and love this Tinker Toy. I had to let the quilt stew for a while before a quilting idea came to me! 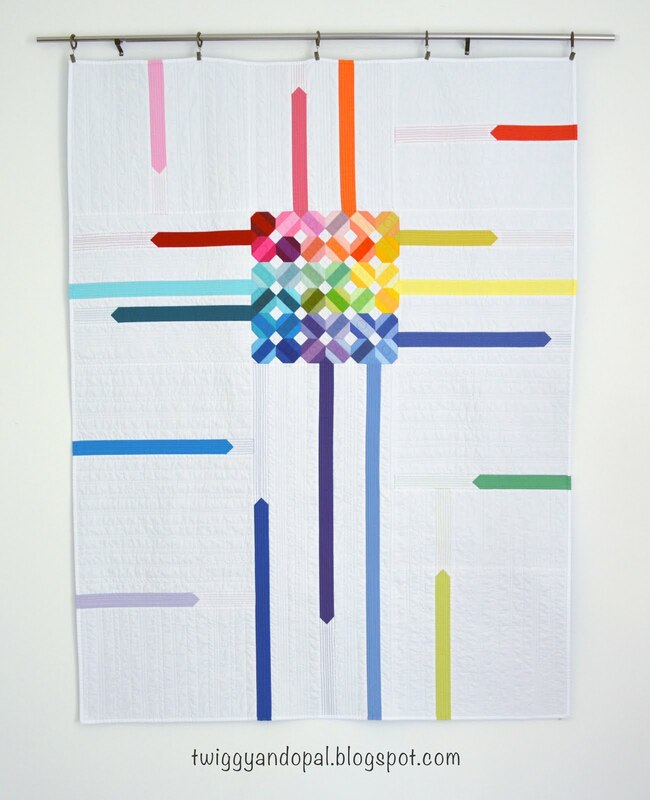 Tinker Toys were a lot of fun as a child…and now I got to play with them as an adult in quilt form! What a wonderful creation! The name suits it perfectly! Totally awesome!! You have a real gift for designing girlfriend! I had Tinkertoys as a kid and my kids also had them. That's adorable. Is there a pinterest link to that quilt? Wow. What an interesting piece, right down to the matched binding! Nice job choosing quilting that really accentuates your design. 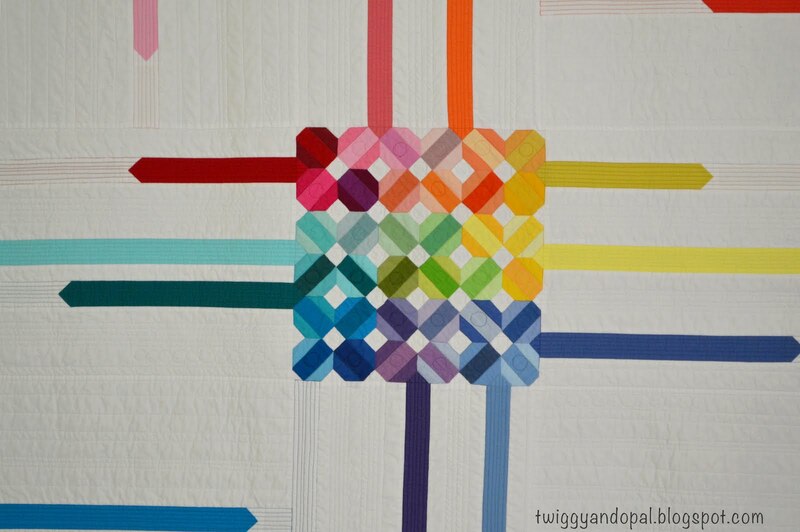 I love the name for the quilt, the circles in the octagons really seal it for me. Perfection! And way to go taking the time to line up the colored lines in the negative space and the binding. I can appreciate the effort that must have taken. It's a perfect name for this quilt Jayne. 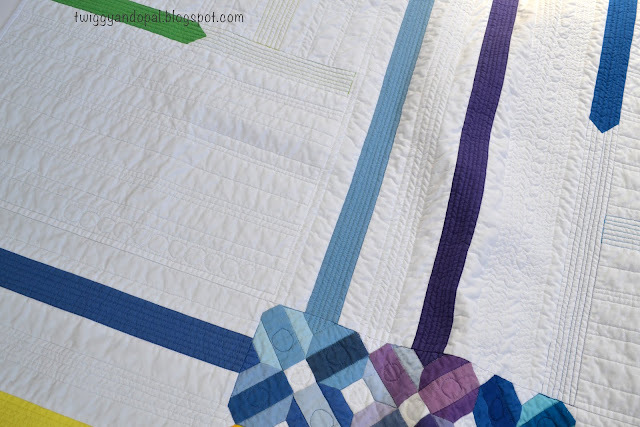 The stripes of colour work so well to take the patten out into a quilt. Awesome. Tinker Toys is the perfect name for this fun design. I love what you came up with to incorporate your EPP. And the matched binding was a clever finish! Oh Jayne, I really don't know where you get your ideas from, it is so lovely. You must have a huge thread collection, or a big thread budget, it makes such a difference though. I might have been dropped on my head as a baby…it could have altered my thought process later in life!!! I’m not sure where these ideas come from either, but it sure is fun! I have a pretty good thread supply in every brand available! Plus, I keep even the tiniest remnants for just such occasions! Love - Love - Love this quilt!!! Wow ! Great finish Jayne ! jayne, this is genius!! Love it!! I remember Tinker Toys!! Such fun to play with. It's the perfect name for a fabulous quilt, Jayne. Love it! I often thought of tinker toys as having some great shapes but not sure I would have been able to make it this cool. Such a cute quilt! I love the colors!!! I love the way you extended the original piece; the result is stunning. I hope you don't mind; I've posted it to my Pinterest board, (https://nl.pinterest.com/marlyquilts/improv/) but will remove it immediately if you object. This is great Jayne! I love the matched binding, and love the name...I had a set just like those in the photo. WOW ! 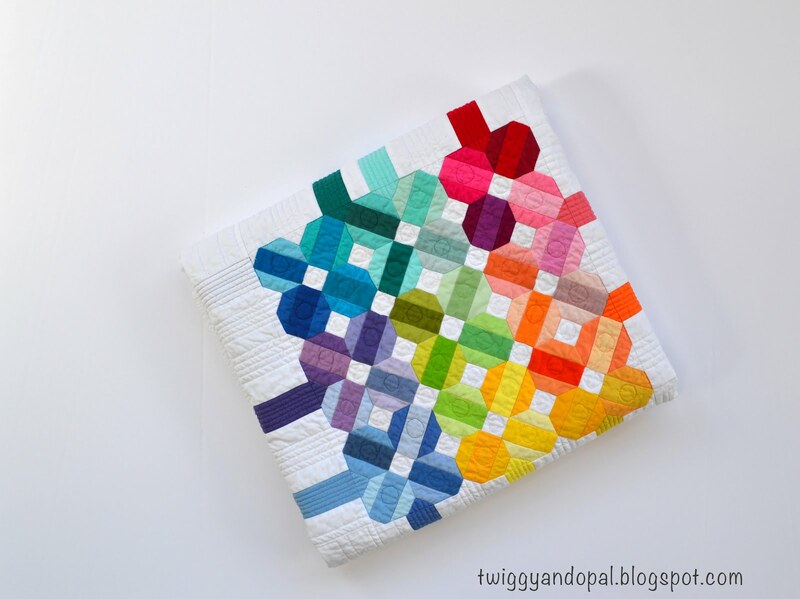 This is a fabulous quilt ! You are truly a gifted artist. 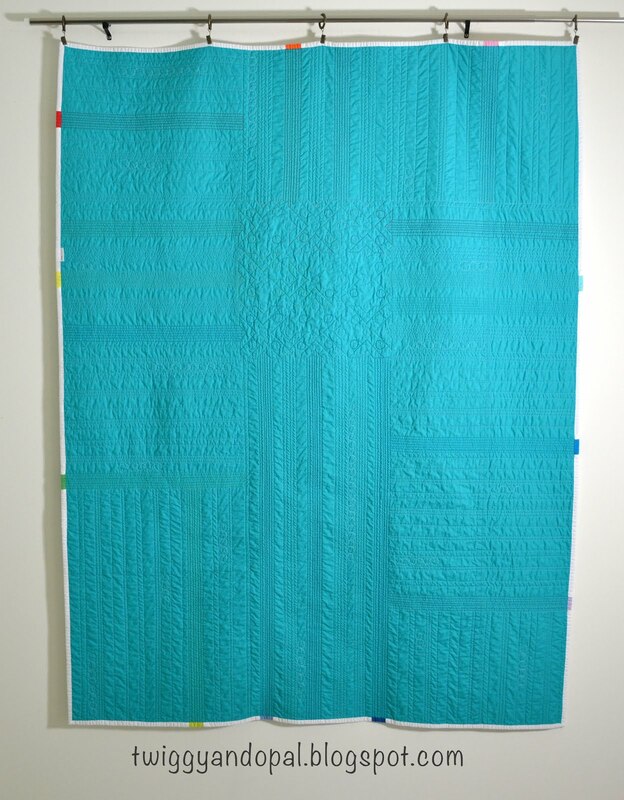 A beautiful finish Jayne, those strips work so well with that centre, and the quilting is perfect, great work!! Perfect name! I really like how you expanded out the design from the middle. Jayne, this is beautiful! And the name fits perfectly. Needle & Foot Giveaway Winner! March Madness :: Are You With Me?! 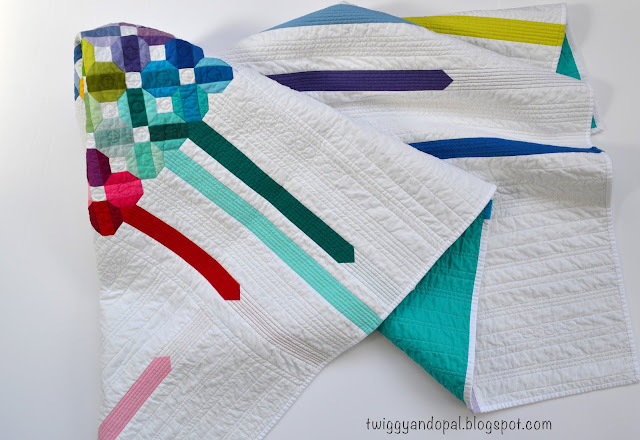 Needle & Foot Blog Hop Celebration + GIVEAWAY!